Fruity with sweet notes. 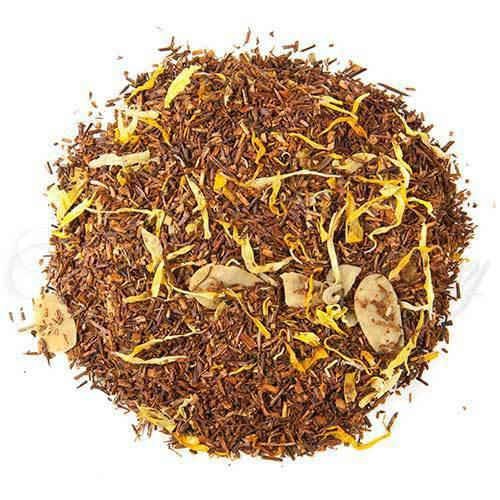 Vanilla flavoring gives the rooibos a wonderful exotic jazzy depth. Almond pieces and calendula petals make this an excellent non-caffeinated choice. . Manufacture Type(s): Rooibos : Traditional process, Rolled and fermented. Is there any other street in the United States that conjures up as many exotic images as does Bourbon Street in the heart of New Orleans’ French Quarter? From Voodoo to Jazz and Burlesque to Mardi Gras, Bourbon is the street where anything can, and does, happen. (Don’t believe it? Pick up a copy of A Confederacy of Dunces by John Kennedy Toole – considered by some to be the most accurate depiction of the French Quarter ever written. And it’s hilarious!) Or if you prefer, take a trip to New Orleans and experience the street for yourself. Very flavorful. This tea have a deep satisfying vanilla flavor with a smooth finish, and no caffeine.